The Fox Cove cottage is such a darling cabin. Very close to the water. Nice little patio to sit at and enjoy the big wonderful lake. The cottage is surrounded by lots of wild flowers, which adds to the charm. The only issues we had was the 2 black chairs that needs to be replaced..They are peeling and left peelings marks on my daughters legs. They also need a larger sofa. The one that's there looks like part of a sectional they split up. Also a biggest bummer was the fireplace. Its such a lovely charming fireplace and it doesn't work!! They really need to get it fixed. There's nothing better having a nice fire going.The tv was hard to figure out. Beds were (very) comfortable. Very comfortable! The perfect Christmas getaway! We really enjoyed R&R! You promised it would be a special place and it was. The lake was so accessible and right off the deck, the waves pounded for at least one day. The cabin was simple and elegant. I especially enjoyed the art work! The kitchen had everything we needed. It was a cozy, relaxing place to spend on a cold, rainy weekend. Thank you for solving our problem so wonderfully. Another wonderful experience at R and R! We love being right on the lake and listen to the waves come in. The location is perfect for our hiking on the SHT. We are sad that after next year our journey on the SHT will require us to find a place to stay farther south. Hope we will be able to find a place just as nice. Shower head was loose, and water filled the tub during the shower. Mattress in back bedroom could be replaced. Loved the location, deck right on Lake Superior was fabulous! So close to the town of Lutson, which had everything we needed. Check in and check out was so easy, loved that! R & R is one of our very favorite places to stay on the North Shore. 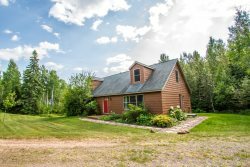 The cabin is cozy and comfortable, unbelievably beautiful pottery dishes and bowls and art work everywhere, great location so close to Lutsen for groceries etc. and so private and quiet. During the warmer months there is the best deck on the entire North Shore we believe. Huge, right up to the edge of the rocks. Views of the majestic lake from all the huge windows. Just perfect actually. We are repeat visitors to R&R and truly enjoyed our stay. We absolutely love the complete privacy of the cabin and its location to the lake. The cabin is well furnished and comfortable. We did enjoy the wood fireplace that we experienced during our first stay at the cabin and felt there was something missing this time around now that it is a gas unit, but understand the benefits of such a change. Its such a comfortable and cozy cabin with all of the amenities we need. R & R is a beautiful cabin that is well equipped (and extremely clean) with all the essentials for a wonderful stay. It is evident that the owners take a great deal of pride in the building and property. The location is amazing and we could hear the waves crashing on the rocks throughout the day and night! The beds and furniture are very comfortable and the cabins coziness is perfect for a relaxing getaway. This place is perfect for us. We are hiking several sections of the Superior Hiking Trail every year, so this is our base. We are two couples. We like to put puzzles together. The big table in the R&R is great for that. And we're right on the lake. And its private - can't see any other cabins. It fits our needs perfectly. We are two couples, so we need at least 2 bedrooms - R&R has three. We want to be on the lake. We are hiking two sections of the Superior Hiking Trail every year, so we need something close to our new sections. We want a fireplace. The deck is wonderful! The couches in the living space are comfy. And the picnic table is perfect for our needs - putting puzzles together on one end, and eating on the other.